Report from Ubicomp 2002 | JONAH BRUCKER-COHEN, PH.D. Report from Ubicomp 2002 – JONAH BRUCKER-COHEN, PH.D.
Held in the Draken (Swedish for “dragon”) cinema in the west end of Gotenborg, Sweden, UBICOMP 2002 was a short academic conference focusing on utopic visions of the integration of computing into every aspect of the physical world. From tiny microprocessors in your coffee mug to providing comfort through voice commands with the SmartHome, the papers presented shared a common view that technology will eventually be just as natural an element as water, air, and fire. It will be cheap enough to throw away without blinking an eye and smart enough to cater to our needs before we have any. These scenarios of the not-so-distant future might sound both scary and appealing, but the question that seemed to plague everyone’s mind was not only how we get there but will we be better off if we do get there? The conference began with workshops on Sunday. I participated in the “Emotions in the World” workshop focusing on how to contextualize emotions into tangible objects, people, environments, and physiological outcomes. Each group was given an emotion and asked to define it, describe and create a physical manifestation of it, draw its implications, and invent a new product or device that might address its nature. My group’s emotion was anxiety – so you can probably imagine what types of responses we came up with. Our final concept was a networked shoulder massage machine to alleviate anxiety and stress that could only be triggered when someone else close to you also felt anxious – ie. when you were in “bodily sync” with that person. The paper presentations lasted for two days with a few coffee breaks to help wake up everyone’s tired brains. Highlights included “PlantCare: An Investigation in Practical Ubiquitous Systems” from Intel in Seattle which featured a robotic plant feeder for the lazy botanist that would drive up to your plants and water them on a regular basis. Also Hongshen Ma’s (MIT Media Lab) “The FindIT FlashLight: Responsive Tagging Based on Optically Triggered Microprocessor Wakeup” which consisted of a laser pointer sending encoded IRDA info to tags on everyday objects so that when the light’s data matched the object, it would light up to help you find things in your daily clutter. Also a panel discussion about designing for the home brought out important discussion about the future of domestic appliances, furniture, design practice in extended living spaces for seniors, and the historical aspects of architectural spaces and how they might store and save information. I showed SpeakerPhone, a project I developed at MLE, in the poster session which was a room filled with posters of people who submitted shorter papers. These were abstracts of small-scale projects and practical prototypes that focused on some area of ubiquitous computing from PDA applications, to environmental tags, to using game engines for learning environments, to applications for networking tools. I received positive feedback on my poster from researchers passing by – some audio engineers who grilled me on the acoustic aspects of spatialized audio mapping (of which I told I wasn’t a sound engineer). Some ideas for SpeakerPhone included embedding it in the walls of a domestic space for data visualization specifically in the kitchen or home. 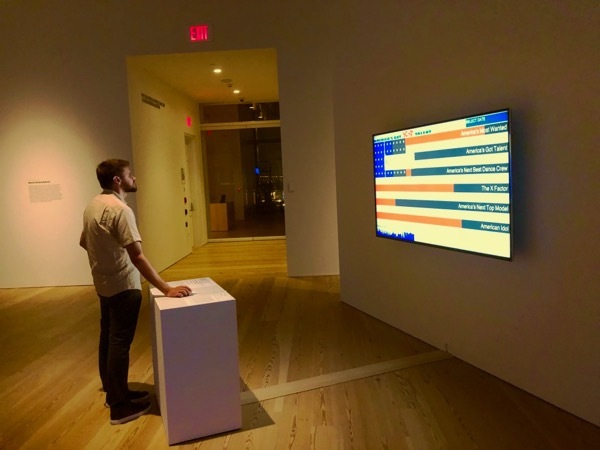 Also people really liked the telematic collaborative possibilities of SpeakerPhone for musicians or performers to collaborate on creating the ambience of a single connected space. Downstairs from the conference auditorium, in the cinema’s restaurant was a large-scale showcase from the EU funded, “Disappearing Computer” project. This display featured live and working demos of projects that dealt with future methods of embedding computing technology into everyday life. These included wearable computing focused on specific scenarios such as avalanche safety as well as Smart-Its (developed by PLAY research et al. ), a platform for adding smart-tags to common objects in order to allow them to perform specific tasks based on their location such as finding lost children or monitoring the state of shipped egg cartons. Other applications included ubiquitous learning environments for architects where you could texture map dioramas by placing surfaces in front of a tag reader. 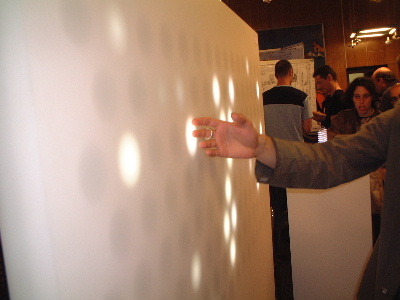 Also shown was the “GossipWall”, a large ambient public display that notifies you of personal messages (email, IM, etc..) in a non-obtrusive way. Overall, the conference was a good intro to the world of ubiquitous computing. There still seems to be a layer of ambiguity surrounding whether or not this proposed future will truly augment our daily lives. Will it make us boring? Never leave our homes? Have too much information at our fingertips? The true realization might be to provide a balance between offering too much information and allowing our imagination to run free within a proposed framework. Many of the projects presented applications of embedded technology, but none of them thought about the human side of adjusting our lifestyles to incorporate this computation. Maybe that conference could be called CHI-OHMY.